These are a couple of the cards I've been working on lately. Process for Rasheed Wallace and Tonya Harding cover of the Willamette Week. The leg made the composition too wide. I brought the leg in to make the composition a little tighter. 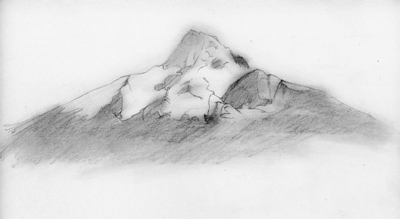 Usually I do one sketch that has the background and foreground. This time I thought I'd try doing separate sketches to see if that would speed up the process. It did! I was able to adjust the brightness/contrast of the background in photoshop without having to interfere with the skaters. Painting the background separately also made the process faster. If I had painted them together, I would have had to block out the skaters and paint in between their legs and arms. This way I could do quick washes without worrying about tape or masking fluid. I wanted to make the skaters look nervous. Here I was able to quickly photoshop the skaters on top of the background. Willamette Week's art director wanted the illustration to be a little more fun and asked if I could redo Rasheed Wallace's face. I did a quick watercolor of just his head and tried to make him look like he's flying for the first time. She also noticed that Tonya Harding's hair looked too short (it was) so I gave her a hair piece. They were definitely great edits that made the illustration look better. Ta-da! I'm pretty proud of it and I got a lot of good feedback. In May I moved from Bainbridge Island to Portland. It was a two-year process of saving, planning, packing and purging. The first thing I did was start propagating the plants in my garden. I wanted to leave behind a garden for the next person, but I also wanted to bring all my favorite plants. The second step was deciding which books to bring and which to give away. That might sound silly, but gardens and books are the biggest inspiration for my work. Albert Camus’ description of the sun makes me feel the weight of an oppressive heat. I want to illustrate every line of Heather O'Neill's novels: "The clip-clopping of the horses' hooves sounded like a room full of children with hiccups." ("The Lonely Hearts Hotel") I hope I can communicate human emotions in my illustrations as well as they do in their writing. Since moving here, I've been to the Portland Japanese Garden three times and spent way too much time at Powell's City of Books. They have a huge philosophy section where I found the first and second volumes of Michel de Montaigne's essays with an accompanying handbook that goes through each paragraph. Did you know Montaigne was the first person to call essays, Essays? Before that they had been called leçons. After three months of living here, I already love it. Last night I took down the exhibit at Blackbird Bakery. It was so gratifying to be able to see people look at my work and talk about it and actually like it. All those times I felt completely discouraged and wondered why I was still trying so hard when it felt like I was getting nowhere. This is my personal work that came out of that period when people asked, "so what do you do all day at home? Aren't you bored? Why don't you get a job?" No, I wasn't bored; I worked all the time, and I was working toward a career. While it felt fruitless most of the time (all the time, really) I kept painting. From this exhibit I sold a few painting, got a few commissions, and got a ton of exposure. It felt like a huge success and I'm so grateful to Blackbird Bakery, especially Heidi for being so generous and supportive. Glorified Appropriation got into the Illustration West 54 exhibit. I seriously ran around the house screaming like Olive Hoover. It will be on display at the Gallery at the Society of Illustrators of Los Angeles, and there will be an opening reception on Saturday, November 7th from 7:00 to 10:00 pm with the Awards Ceremony at 8:00 pm. I have my work on display at Blackbird Bakery this month and was asked to do an interview for the paper. Jessica Shelton was the wonderful journalist who interviewed me and wrote this fantastic, flattering article. On the morning the paper went on sale she emailed me to let me know that I was on the front page!! And a week after the exhibit went up I got a commission to do a portrait. October is a good month. Now I'm getting my dooneese costume ready for halloween; tiny hands and all. Here is another video of my process. I learned how to use Premiere Pro and Lightroom to make it. Pretty fun! These are the things that keep me going during an especially busy day. One tiny video you can watch three times in a row, have a belly laugh and go on with your work. A Good Book Cafe asked if I wanted to join some authors in a booth at the Rhubarb Festival. They had me at rhubarb–I love it. So last Saturday, Mike and I drove down to Sumner and had a lovely time meeting local authors and getting to know the staff at A good Book Cafe. There was a former police officer who wrote about his time on the force in Sumner, a fifteen year old who was already published, some wonderful cookbooks by Rachel Vdolek. After my time slot was over I really wanted to go get a rhubarb margarita, but I had to rush to Bellevue to drop off the painting. So now I have to go back next year and celebrate with all the delicious rhubarb goodies. Maybe in the meantime I'll try to make a margarita on my own. Wheee! This is an illustration I did in 2011 for a promotional mailer with some other students at SCAD. A few weeks ago I was contacted by the Bellevue Friends of the Library and asked to donate something for their silent auction and fundraiser in December. I really wanted to help since I love libraries and use them ALL the time. (I also have a lot of fines because I take out too many books at a time and try to read them in the two weeks before the next person on the waitlist gets them.) Anyway, I have a gallery coming up and didn't want to give away any of my new work since that's going in the gallery. So I looked through some old illustrations and found this one, which I like a lot, but I thought it could look better. After adding some shadows in the house, (it was a really well lit house for being underground) texture to the tree, fixing up the face, and adding more grass, I thought it looked quite a bit better. Hopefully it will raise some money for the Seattle libraries, and I can feel a little less guilty about avoiding my late fees. There was a Julia sighting at Barnes & Noble! This is a video I made to show my process. I work in watercolors and do a LOT of layering to get the highlights and shadows. While I was painting I took a photo every few seconds to make a stop-motion-y video. You can see the light change depending on the time of day and the shadow of my head bobbing around. It's a little jerky, because I had an old battery that had to be charged every couple hours. That involved taking the camera off the tripod, removing battery, charging it, and putting it back together in the same spot. Since then I bought a new battery and hopefully if I ever make another video it will stay still and I'll know a little more about lighting. So for now, enjoy! Last night I was at the University Book Store for SCBWI's Inside Story. It was such a privilege to be involved and have the chance to meet so many wonderful authors and illustrators. In the days leading up to the event I had a stomach ache from nerves that got progressively worse. Once I got there and talked to some of the even coordinators and other speakers I slowly started to feel better. Everyone felt like kindred spirits who I had known for years. I mean, they draw and read and write for a living– how could I not feel connected? Since I was in the middle of the line up I had a chance to hear what was generally said and I thought, "this isn't so bad. It's not supposed to be about some ingenious epiphany I had while making the book." So I talked about my experience making croissants and how much time and butter went into making them and how it was all worth it. Then I said that was kind of what making the book was like. With a two minute time slot, that about did it. It was fun and I can't wait to go again to see the next round of new books. Photo courtesy of Mike Gorham, who was supposed to be studying, but came to support me instead. 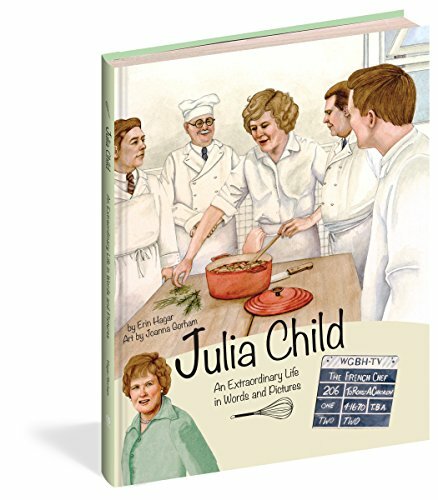 A great article about Erin in the Baltimore Sun, the author of Julia Child: An Extraordinary Life in Words and Pictures.